A computationally efficient, 2D SCR catalyst on a DPF (SCR-F) model was developed to simulate the pressure drop, filtration efficiency, outlet NO, NO2, and NH3 concentrations, PM, temperature, and NH3 storage distributions. The model extends previous work (Mahadevan et al. :J. Emiss. Control. Sci. Technol.1, 83–202, 2015; Mahadevan et al. :J. Emiss. Control. Sci. Technol.1, 255–283, 2015; Mahadevan et al.:J. Emiss. Control. Sci. Technol. 3, 171–201, 2017) by adding a 2D reaction-diffusion scheme-based chemical species solver with SCR reactions inside the substrate wall (Park et al. :Ind. Eng. Chem. Res. 51, 5582–15592, 2012). The experimental data (Kadam, 2016) used for the model calibration was collected on a Johnson Matthey SCRF® operated with a 2013 Cummins 6.7L ISB engine with tests spanning a wide range of operating conditions including PM loading and oxidation with and without urea injection. The major features in the model consist of (a) inhibition of SCR reactions by wall PM, (b) SCR reaction–based energy release, and (c) diffusion in the channels, forward diffusion between PM cake and substrate wall layers. The model can simulate transient conditions including the prediction of a 60–70% decrease in the NO2-assisted PM oxidation rate during urea injection, 2D temperature distribution within 5 °C of the experimental data, and the resulting PM and NH3 storage distribution by simulating the 10–15 °C temperature rise during urea injection. The maldistribution of NO, NO2, and NH3 concentrations caused by the temperature distribution and the inhibition of SCR reactions by PM in the substrate wall was simulated and the resulting outlet emissions agreed with the experimental data. The model can also be used for 2D CPF analysis by turning off the SCR reactions. 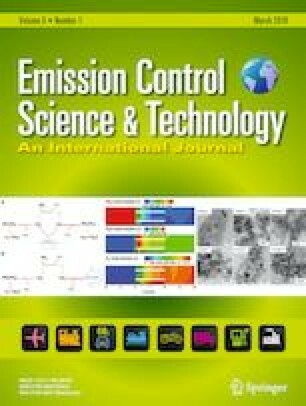 The authors would like to thank the MTU Diesel Engine Aftertreatment Consortium which supported this research work. The partners in the consortium are the following: Cummins, John Deere, Diamler-Detroit Diesel, Tenneco, Corning, Johnson Matthey, and Isuzu. The authors would like to thank the reviewers whose comments and feedback have helped us to improve the paper and the SCR-F model. SCR-F model consists of sub models to predict temperature and PM mass distribution, pressure drop, and species concentration at the outlet of the filter. The detailed formulation of the sub models are presented in the following section. The energy balance in the SCR-F is affected by the heat transfer within and external to the filter. Figure 31 shows the schematic of the temperature solver mesh used in the filter temperature model. The gas energy balance equations accounts for the axial and radial conduction, convection, energy release due to PM, HC oxidation, and SCR reactions, and heat transfer due to radiation within the channels. The axial and radial temperature distribution of the substrate wall within the filter at each zone is calculated using the gas energy balance (Eqs. (32)–(34)). The gas energy balance equations account for the axial and radial conduction, convection, energy release due to PM and HC oxidation, and heat transfer due to radiation within the channels. At the outermost radial zones, the axial and radial temperature distribution is calculated using the gas energy balance (Eq. (49)) accounting for the ambient heat loss through the can and insulation materials. The inlet flow to the SCR-F was assumed to be fully developed and for a fully developed flow the temperature factor is constant calculated from Eq. (45) . Hence, the inlet temperature profile was calculated using the temperature measurements at the inlet of the SCR-F using the fully developed thermal boundary layer of Eqs. (45) and (46). The SCR-F model uses the upstream inlet temperature measured by a single thermocouple (like ECU measuring the upstream exhaust gas temperature of SCR-F) and calculates the 2D temperature distribution of the exhaust gas entering the SCR-F using Eqs. (45)–(47). Further, the SCR-F model uses the energy balance Eqs. (32)–(34) to predict temperatures at each axial and radial zone of the filter (temperature distribution within filter) accounting for the internal and external heat transfer of the filter. where Qreac, m is the energy released by reaction m, RRm, and ΔHm are the reaction rate and energy release by reaction m.
At the inlet of the SCR-F model (for nodes i = 1 to imax and j = 1), the temperature profile is calculated using the thermal boundary layer equations explained in the following section. Equation (49) accounts for the thermal resistance of the insulation and metal can as well along with the radiation heat transfer to the ambient air as shown in Fig. 31. The number of pores in the substrate wall is given as . The PM oxidation equations include PM oxidation by thermal (O2) and NO2-assisted reactions. The chemical reaction expression for thermal (O2) oxidation is [1, 30]. Similarly, the reaction equation for NO2-assisted oxidation is given by . In pressure drop sub model, the pressure drop at each radial section is calculated by starting out with exit pressure P2|x = L = PBaro and then traversing through all possible streamlines (dashed lines) shown in Fig. 32. The mass flow correction in Eq. (73) continues until the pressure drop calculated in every radial zone becomes equal. Oxidation reactions—NO, CO, HC, and PM oxidation. SCR Reactions—Standard, fast, and slow SCR reactions, NH3 oxidation, adsorption, and desorption. Molecular density of exhaust gas mixture (ρexh)w is constant in the PM cake + substrate wall control volume. The SCR reactions considered in the SCR-F model include the standard, fast, and slow SCR reactions. The adsorption and desorption of NH3 has also been modeled as Arrhenius form for the two sites in which NH3 adsorption takes place. Equations (88)–(90) show the equations used for adsorption and desorption of NH3. where Cl is the concentration of species in the given domain, dt is time step size and dx is length of axial division, vw is the velocity of exhaust gas through the PM cake + substrate wall. ξl,m is the stoichiometric coefficient of chemical species l in reaction m, and Rm is the reaction rate of reaction m. Ω1 maximum storage capacity of first NH3 storage site in the SCR-F capable of both storage and consumption on NH3 by SCR reactions, θ1 is the storage fraction for the first site. Similarly, Ω2 and θ2 are the storage capacity and coverage fractions for second site responsible for only storage of NH3. Part of the development of the SCR-F model was to show that it could also be applied to a CPF. For the simulation and analysis of the DOC-CPF aftertreatment system, the SCR-F model developed in this work was configured to simulate the performance of a 2007 inline 6 Cummins ISL 8.9-L diesel engine equipped with a DOC and CPF aftertreatment system. Experimental data recorded by Shiel et al. and Pidgeon et al. at 18 different operating conditions for three different fuels (ULSD, B10, and B20) were used to calibrate the model. The detailed experimental setup, CPF temperature measurement layout, engine and aftertreatment specifications and test procedures are explained in references  . For the purpose of SCR-F/CPF model validation with the DOC-CPF aftertreatment system, the model was calibrated using the experimental data at 18 different operating conditions (six passive oxidation experiments and 12 active regeneration experiments). To demonstrate the model capability, the simulation results from one of the active regeneration tests (AR-B10-1) along with the experimental data are presented in this paper. The summary of active regeneration experimental data used for the model calibration is shown in Table 8. During active regeneration, most of the PM retained in the CPF is oxidized by thermal (O2) PM oxidation. The oxidation rate of the thermal (O2) PM oxidation is faster than NO2-assisted PM oxidation because of the higher CPF inlet temperatures (450–600 °C). Hence, the active regeneration experiments take shorter time to oxidize PM compared to NO2-assisted PM oxidation experiments. For the active regeneration experiments studied in this work, PM oxidation (by active regeneration) duration was about 6 to 39 min. This faster oxidation of PM within the CPF affects the heat transfer within and external to the filter, and in turn the temperature and PM mass distribution. The SCR-F/CPF model simulation results of one active regeneration experiment (AR-B10-1) and the results are presented in this section. 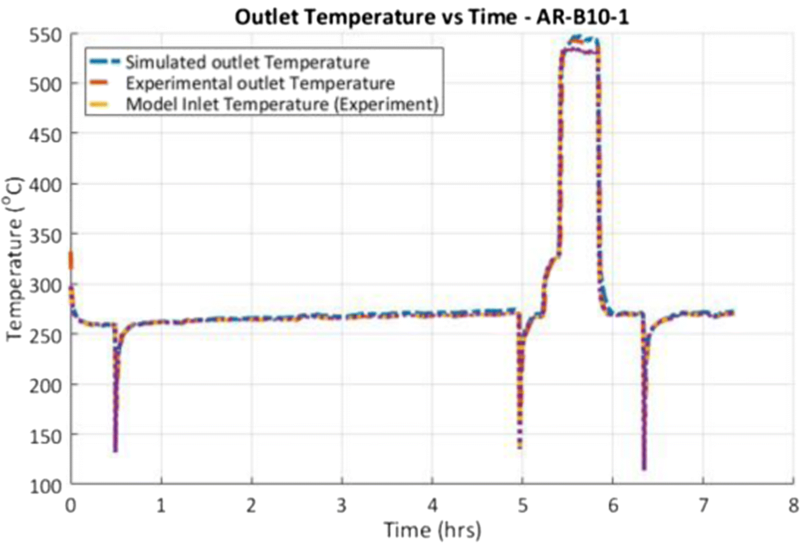 Figure 33 is the comparison of experimental and model CPF outlet gas temperature with model input CPF inlet gas temperature for AR-B10-1 experiment. The simulated CPF outlet temperature during PM oxidation by active regeneration is 530 °C (5.38–5.82 h). Simulated CPF outlet gas temperatures are within 7 °C of the measured data excluding the temperature spikes related to the experimental procedure and transition phase of the experiment. Figure 34 shows the experimental and simulated temperature distribution measured by all 16 thermocouples at 5.63 h (15 min after start of fuel dosing) respectively. From Fig. 34a, b, the simulated temperature distribution closely follows the experimental data with the maximum root mean square (RMS) temperature error of 3.1 °C. For filter radiuses below 40 mm, the filter substrate temperature increases axially (10–12 °C) due to local PM and HC oxidation. The radial variation in substrate temperature is up to 40 °C. This is mainly because of the inlet temperature distribution caused by the thermal boundary layer development in the upstream of the CPF. Figure 35a shows the cumulative PM mass retained in the experimental data and simulation model along with the model cumulative PM inlet, cake, and wall PM masses for AR-B10-1 experiment. Simulated PM mass retained closely follows the experimental data. The maximum absolute error between simulated PM mass retained and the experimental data is 1 g at the end of stage 3 loading. Figure 35b shows the comparison of PM mass retained in the experimental and simulation model data along with the model cumulative PM inlet and oxidation masses for AR-B10-1 experiment. From Fig. 35a, the overall PM oxidized (at end of post loading at 7.33 h) by thermal (O2) assisted PM oxidation is 91%, whereas the NO2-assisted PM oxidation is 9% due to the lower NO2 concentration in the exhaust gas. Figure 36 shows the simulated PM mass loading distribution at the end of PM oxidation for AR-B10-1 experiment. In Fig. 36, the PM loading distribution varies significantly along the radial direction. The PM loading is less than 0.6 g/l up to a filter radius of 80 mm and increases to a maximum of 1.6 g/l at the outer radius of the filter. 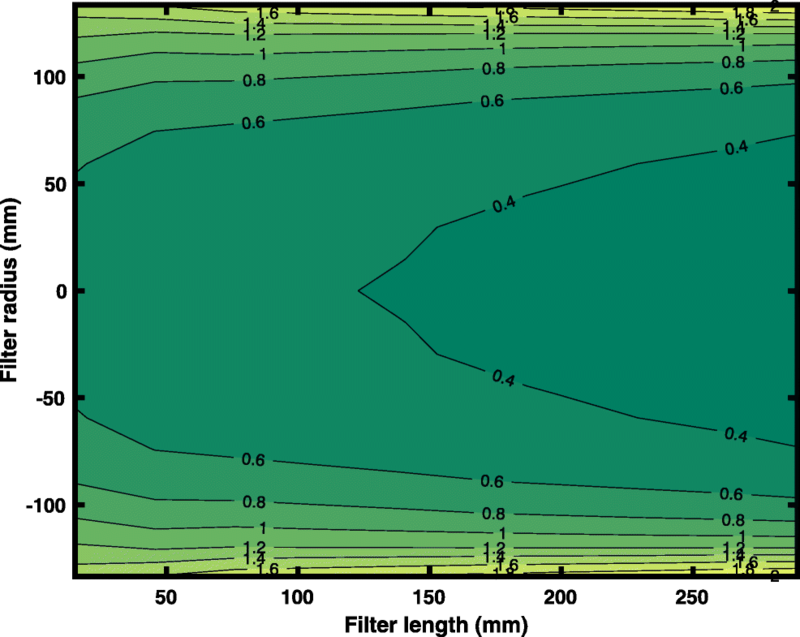 This is mainly due the lower exhaust gas temperature at the outer radius of the filter (as shown in Fig. 34a) due to the convective and radiative heat losses compared to the center of the filter. Figure 37a shows the comparison of the experimental and simulated total pressure drop across the CPF and its components of AR-B10-1 experiment. From Fig. 37a, the simulated pressure drop values are comparable with experimental data with a maximum absolute error of 0.3 kPa during AR ramp phase of the experiment (5.3 h). During PM oxidation by active regeneration, cake pressure reduces to 0.1 kPa. The slope of the pressure drop curves (cake and total pressure drop curve) changes during PM oxidation by active regeneration. This was attributed to the damage in the PM cake layer during PM oxidation and the damage of the PM cake during PM oxidation (by active regeneration) and the corresponding increase in PM cake permeability was correlated to the change in PM mass retained and PM oxidation rate as Shown in reference . 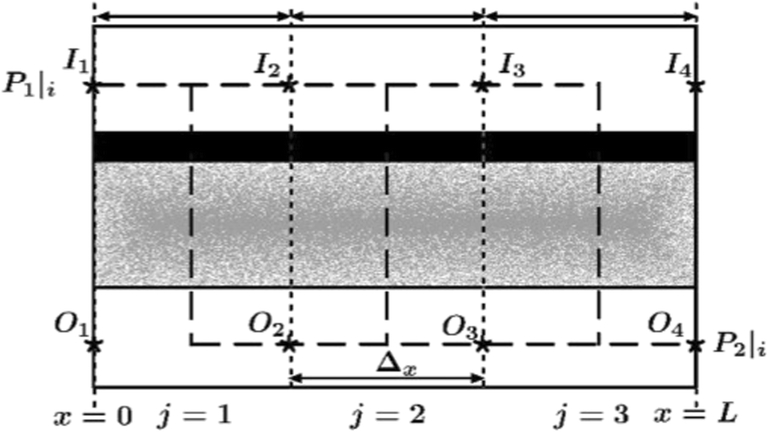 The detailed development of the damage cake permeability equation is explained in reference . The increase in PM cake permeability during PM oxidation by active regeneration is shown in Fig. 37b along with the wall permeability and PM mass retained in the cake and substrate wall. The increase in cake permeability occurs at 11 min for the PM oxidation by active regeneration. At higher reaction rates, the PM cake layer is oxidized rapidly, resulting in significant cake PM mass reduction before initiation of cracks and holes in the PM cake layer. Similarly, for lower reaction rate case, the PM cake damage occurs at higher masses of the PM cake as the PM cake layer is exposed to oxidizing environment for longer period of time without significant reduction in its mass. Overall, the SCR-F/CPF model was configured to simulate the performance of the DOC-CPF aftertreatment system. The model shows good capability in predicting temperature, PM mass distribution, and pressure drop of the CPF. From the experimental data presented in this work for AR-B10-1 experiment, the RMS temperature distribution error was within 3 °C during PM oxidation, the PM loading error was within 1.9 g, and the pressure drop error was within 0.3 kPa.